A review of Nostalgia imperial: crónicas de viajeros españoles por China (1870-1910) [Imperial Nostalgia: chronicles of Spanish travelers in China (1870-1910)], by Qing Ai. Spaniards did not completely vanish from the colonial arena in the 19th century, despite the loss of the American empire in the 1820s. This was true in Asia, where the Spanish dominion in the Philippine Islands lasted until 1898, not without problems. Not so surprisingly, the Spaniards were a small part of the Western penetration in 19th-century China, along with other “small” Western powers – such as Portugal, Italy, or Belgium – with its own, yet erratic, agenda. Even though their presence in China was not as prominent as that of other “bigger” nations, not a few Spaniards went to China at the end of the century and left their impressions in travel writings. Making use of a vast array of documents from various Spanish archives, Dr. Qing Ai’s dissertation comprehensively assesses this particular colonial discourse. As the author remarks, these records have been largely ignored by other scholars. With their peculiarities, these Spanish voices are an alternative version of Orientalism, imbued with the sense of loss of imperial prominence and the feeling of national crisis. As Ai says, “Spanish travel writings provide a unique perspective from a Western empire that shared a similar fate with the Other: both being traditional and decadent nations” (p. xv). This particular colonial discourse is reshaped into an aspiration for the recovery of imperial prestige and the recognition of Spain at the same level as the other imperial powers. Furthermore, these accounts meditate on Spain’s problems in the difficult 19th century, hence suggesting a wider scope for ambivalence, compared to other Western powers’ discourses, namely, a “difficult conciliation between the colonial discourse and its resistance, ideology and utopia, as well as imperialist ambition and national crisis” (p. xvi). Spanish discourses about China thus become “an allegory of imperial nostalgia: a yearning for the imperial power that had vanished, without hope of restoration” (p. xvi). This is the main contribution of this investigation. Scholars devoted to Orientalism may be interested in this history of literature, as it provides an alternative approach to the complexities and diversity of the colonial discourse. This study also tackles several key questions regarding the history of empire in general and the Qing Empire in particular, more specifically, the complexities of the Western penetration in China. It will also be of great interest to scholars devoted to the history of Spain, Spanish fin de siècle anxieties during the 1898 Crisis, and more specifically, an exploration of the moral background in the Spanish national discourse and its longing for a “splendorous” imperial past. The goals of this dissertation are threefold. First, it clarifies the bibliographic genealogy of Spanish travel writings. Second, it identifies a particular Spanish colonial discourse in these travel writings – vis-à-vis other European powers – aimed at regaining a lost imperial prestige, facing national decadence and imperial anxieties, thus showing how “the representation of the Other entailed a strong internalizing sentiment” (p. xxii). Third, this dissertation stresses how ambivalence is more prominent in Spanish travel writings when compared with its European counterparts, as colonial discourse and its resistance coexist in them, within a difficult conciliation between imperial ambition and unequivocal national crisis. The first chapter provides a theoretical and historiographical framework, wherein the importance of travel literature in recent years is stressed. It provides “a privileged perspective for the exploration of intercultural encounters,” redefining “imperialism, postcolonialism, ethnography, diaspora, frontier and exoticism” (p. 2). Travel literature, Ai says, is essential to the formulation of Otherness, as it perfectly displays all tensions and complications of the colonial discourse, which appear to a high degree in Spanish travel writings in China. Indeed, the Spanish colonial discourse particularly shows this tension between imperial ambition and a blatant colonial crisis, sometimes adopting some distance and even a critical stance toward foreign invasion in China. An approach to the Spanish chronicles is provided in Chapter 2. Rather than fastidiously providing a portrait of Spanish travelers and their works, this chapter shows in a comprehensive fashion which Spaniards used to go to China and how. Missionaries, diplomats, military men and sailors, artists, to which the author interestingly adds aristocrats – and we should also add traders who certainly acted from Manila – traveled to China and registered their impressions in several books, diaries, chronicles, articles, reports, etc. This chapter also names the media where these discourses appeared. This is very useful information on how accounts about China reached Spain at the end of the 19th century. The author also devotes a very amusing section to fictitious travels, which reflect this particular Spanish ambivalences as well. The third chapter analyses the Spanish colonial discourse as such, defined by the author as that of a problematic colonial authority, implying mainly “a search and recuperation of imperial prestige” (p. 76). She then goes further when considering the lack of Spanish presence in China, for its colonial discourse “does not work as an affirmation of colonial authority but as a proof of the absence of authority” (p. 77). Furthermore, by means of trying to restore a lost international prestige, Spanish accounts also attempt to recover “a sort of lost Spanish identity” (p. 79). Here several discursive strategies resorted to in Spanish travel literature are analyzed, such as adopting a superior position, or negotiating Spanish identity within European nations. These accounts emulate the European colonial discourse, and even go beyond it when representing Spain as occupying “a moral high ground” in the absence of “material power” (p. 99) in the same manner as self-depictions of the nation in 1898 Spain. Chapter 4 is devoted to elements of resistance implied in colonial discourse, as forms of ambivalence, which are common in Spanish travel accounts in China as aforementioned. Representation of the Other reinforce imperial ideology while undermining it, colonial discourse thus being a complex contact zone where contradictory ideas may coexist. Several examples are analyzed by the author. First, there is an ambivalence resulting from emphasizing racial difference while striving to efface any form of difference under one civilization. At the same time, this resulting hybridity leads to European fears, such as that of the “Yellow peril.” Second, numerous examples of resistance and confrontation by the Chinese to European expansion also appear in Spanish travel literature, such as accounts of how Chinese people stare at Spaniards or address them as “foreign devils.” Third, the author also assesses forms of exoticism in Spanish writings, as a way of rejecting conventional conceptions of Europe, while advocating for new ones. Thus, these writings present a desirable world vis-à-vis a decadent European modernity, rather than trying to be plainly descriptive of their approach to China. To conclude, this investigation gives a voice to the particular Spanish presence in China, reflecting anxieties and “imperial nostalgia” and thereby complying with colonial discourse. Needless to say, Orientalism is not only written in English, French, or German, but also in other languages, as other “small” nations played their part in the Western penetration of China, thereby showing its complexities. These largely ignored Spanish travel accounts may provide more details of the nuances and diversity of imperialism in 19th-century China, besides illustrating Spanish uneasiness about the loss of national prestige and its stance towards a modernizing world. University of Texas at Austin, May 2013. 228pp. Supervisor: Michael Harney. Co-Supervisor: Lily Litvak. 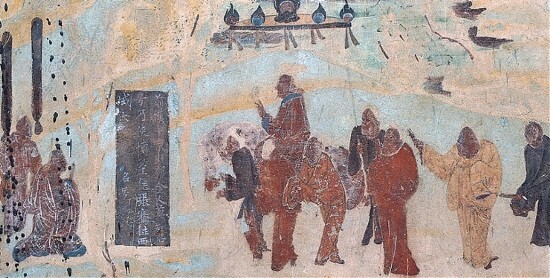 Image: The travel of Zhang Qian to the West, mural from Mogao Cave 323, 618-712 AD.